^ FM 23-35，1940年版本 (PDF). [2009-03-13]. （原始內容 (PDF)存檔於2008-09-20）. ^ Hallock, Kenneth R., Hallock's .45 Auto Handbook, Kenneth R. Hallock, 1980. ^ CHRIS BISHOP. THE ENCYCLOPEDIA OF WEAPONS OF WORLD WAR II. NEW YORK: BARNES JkNOBLE BOOKS. 1998: 231頁. ISBN 0-7607-1022-8. ^ axishistory.com. Axis History Factbook: Handguns. 2008-03-28 [2008-07-31]. 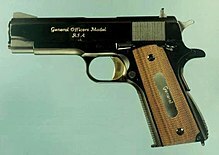 ^ Last military unit to use Colt 1911s drops them from service. popularmilitary.com. [2017-02-03] （美國英語）. ^ Ian's AMT Information site-HardBaller 網際網路檔案館的存檔，存檔日期2009-02-10. ^ Coonan Classic .357 Magnum Automatic 網際網路檔案館的存檔，存檔日期2014-03-26. ^ STAR Model P 網際網路檔案館的存檔，存檔日期2009-03-15. ^ Firearm Review, June 2000. Cruffler.com. [2008-09-08]. 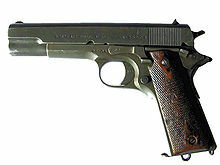 ^ Modern Firearms-Obregon pistol 網際網路檔案館的存檔，存檔日期2008-05-02. Patrick Sweeney. The Gun Digest Book of the 1911: A Complete Look at the Use, Care & Repair of the 1911 Pistol, Vol. 1. North Cape Publications, Inc. 2001年. ISBN 978-1882391462. Dave M. Lauck. Tactical 1911: The Street Cop's And SWAT Operator's Guide To Employment And Maintenance. Paladin Press. 1998年. ISBN 978-0873649858.